My apologies for the length of this download. I kept it on one page for easier printing but it is really long. This document is available in an Adobe Acrobat document for those who prefer that format. I did not include the background in the Acrobat document for faster printing. so Gwen, this one is for you. together in my ElegantLady folder. Open and minimize... You don't need to install it. Open your tube you want to use in the picture. Make a copy of the original. Now close your original image. Minimize the copy of your image for now. Open the background image and minimize it. Open a new image 250 X 250, Transparent background, 16 million colors. Add a new layer. Rename this layer Background. 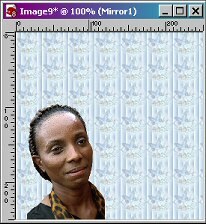 Set your background color to the background image, making sure that the scale is set to 100%. Using the Flood Fill tool place the background image. Open the Person image file copy. Resize if necessary. (I resized the picture I used to 40%). It should fill about half of the canvas vertically. Copy the image and paste into our new image as a new layer. Minimize the image. We will need it again later. Create a new layer. Rename this layer Mirror. 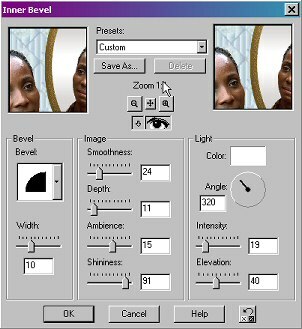 In the color picker(PSP7) or the Materials chooser in PSP8, make the background the DCM-mirror gradient. The foreground should be set to Null. Click on Selections, Select All. Then click on Selections Float. Click on Selections>Modify>Expand and expand your selection 10 pixels. 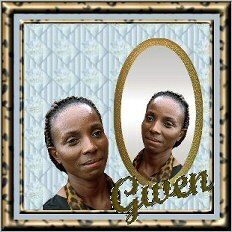 Create a new Layer Rename it Mirror Frame. On the Layers Palette, click on the mirror layer and move it above the Mirror Frame Layer. Create a new layer. Rename this layer Reflection. Keep the image selected. Bring up the image file that was minimized earlier. Remember if you resized it LEAVE IT THAT SIZE. 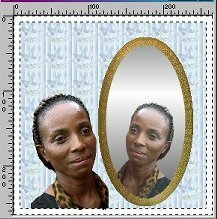 We need to resize again for our reflection. 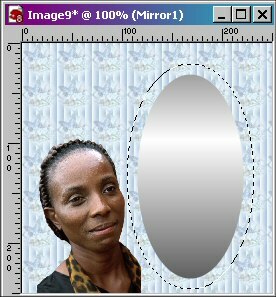 Resize the image to 75%, then click on Image>mirror OR Press Ctrl+M. Copy this image and place as a new layer. 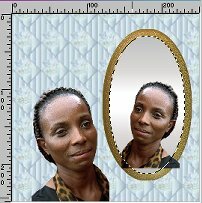 Using the mover tool, position the lady in the mirror. You may find that the picture does not fit all the way to the bottom of the image. We won't be able to see the reflection if we move the layer below the mirror, so we have to fix it..
First we will move our selection back to the edge of the mirror. Click on Selections>Modify>Contract and choose 10 pixels. Selections>Invert then hit the delete key. 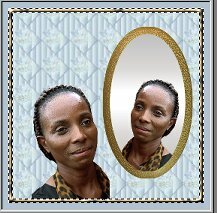 Notice that the bottom of the mirror shows because her neck does not come down far enough. Lets fix that. We will be using the clone brush to fill in the gap. 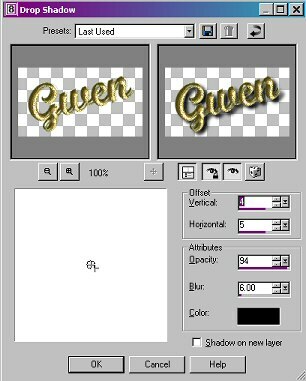 In order to prevent the brush strokes from going onto the frame, we need to go to Selections>invert. Now using the Clone tool (PSP7) or (PSP8) Fill in the gap at the bottom. You might have to undo and redo this several times until you get it like you want. I found that using a tiny size was not good. I used 12 pixels as my size. I cloned from right to left and moved the scarf in at the bottom. When you are satisfied with the way it looks, Ctrl+D to deselect. We are now ready to make our frame. Click on Image>Add Borders. In PSP 8 you may see this screen. If so click OK.
Click Symmetric, make the size 5, then click OK. Using the Magic Wand tool select the new border. 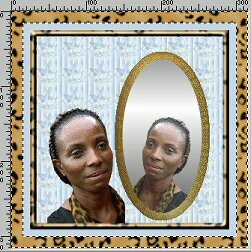 Set your background to pattern and choose the Animal Leopard pattern. Set the Scale to 50. 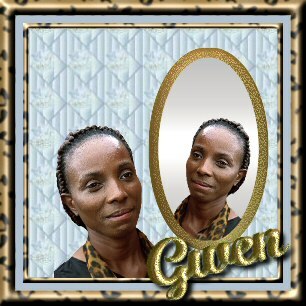 Using the Flood Fill tool fill the border with the Leopard pattern. Here are the inner bevel settings I used. 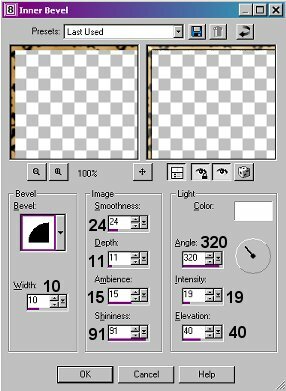 Bevel, use the 2nd one, Width 10, Smoothness 24, Depth 11, Ambience 15, Shininess 91, Angle 320, Intensity 19, Elevation 40, Color White. Now we have this And on we go!!! Change your background color to one of the darker blue colors in the image. I used #B2C2D2. Click on Image>Add Borders and add another border 8 pixels wide. We will add borders again. Change your background color to white. Click on Image>Add Borders and make it 15 pixels wide. 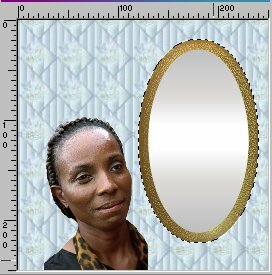 Using the Magic Wand tool, select the border. Apply the inner bevel using the same settings as before. And the image is finished! Now we need to add the name to the image. Be sure your background color is white. Set the Foreground color to Null. I added a Super Blade Pro treatment. Click on Effects>Plugins>FlamingPear>Super Blade Pro and choose the DCM-golddark.q5q file and apply it to the text. Now add the name again, same settings and rotated the same amount, right on top of the other one. Click on Effects>Plugins>FlamingPear>Super Blade Pro and choose the DCM-gold7.q5q file and apply it to the text. 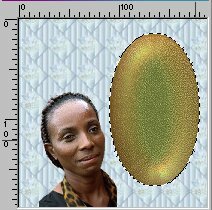 With one of the raster layers highlighted, right click and click merge, then merge visible. On the merged image, add a drop shadow. Here are the settings I used. Offset: Vertical - 4, Horizontal - 5, Opacity - 94, Blur - 6, Color Black. And now you have it! You did it! Congratulations. I hope you have enjoyed doing this tutorial and along the way, maybe you learned something new.